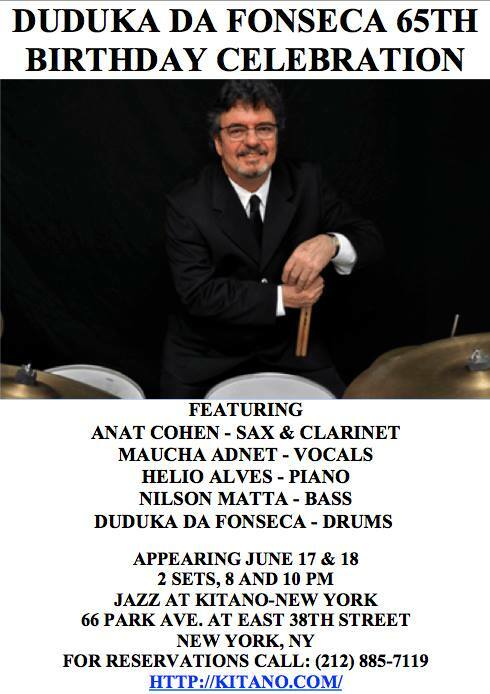 Mauricio Zottarelli Quartet live, tonight! 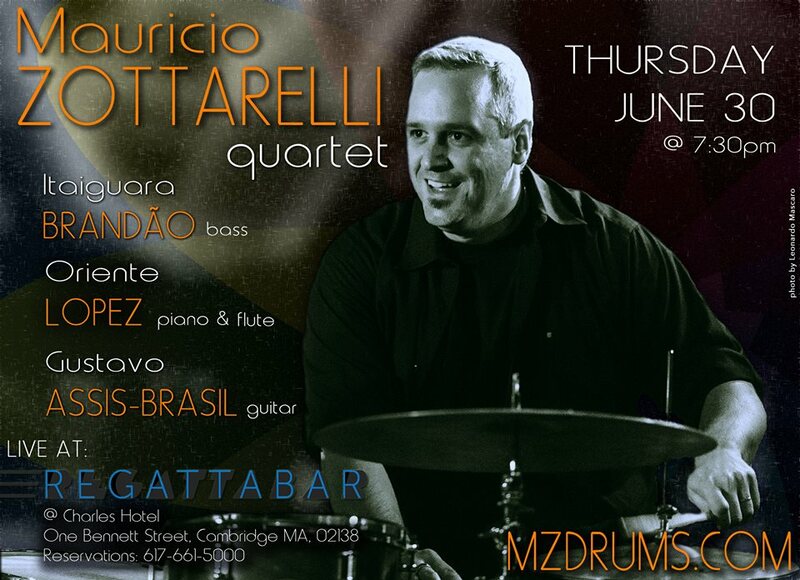 Medici Musica Productions Prresents: Mauricio Zottarelli Quartet in MA! One of the world's greatest drummers in the contemporary jazz scene, Mauricio Zottarelli performs a rare concert as a leader tonight, June 30, 7:30pm, @ Regatta Bar at Charles Hotel in Cambridge, MA. 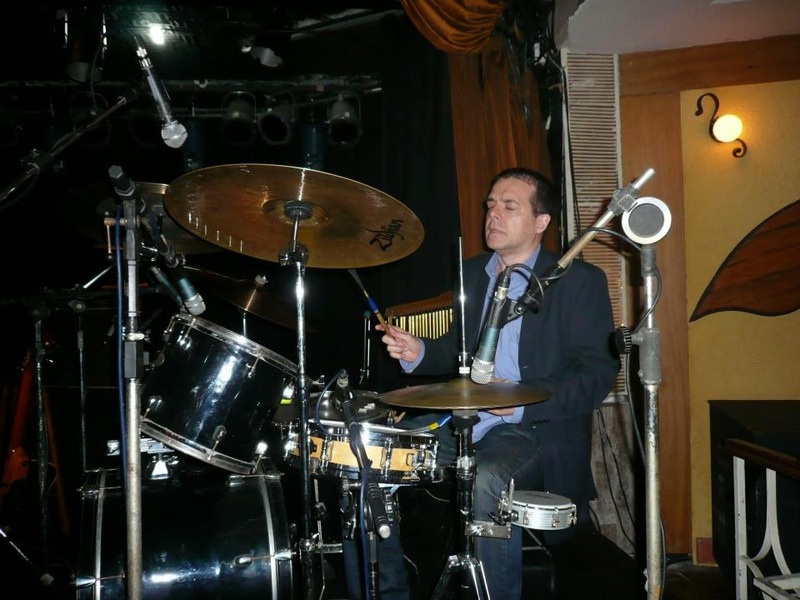 Brazilian born, New York City-based drummer/composer Mauricio Zottarelli has been on the forefront of the Jazz, Latin and Brazilian music scenes for many years. 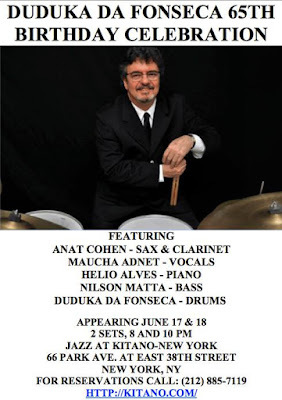 Called a "superb drummer" by JazzTimes magazine, Zottarelli comes from a musical family and was born in Santos, SP, Brazil, but grew up in Rio Claro, SP in a highly musical environment. His first few years as a professional musician consisted of many performances throughout his native country as well as studio and session work with different artists and bands. At the same time, he pursued a degree in Computer Science, and concluded his studies in 1997. Mauricio moved to the U.S. in 1999 after winning a scholarship award to study at Berklee College of Music, in Boston, MA. He majored in Film Scoring, Performance and Arranging, and graduated from the prestigious college in 2002. 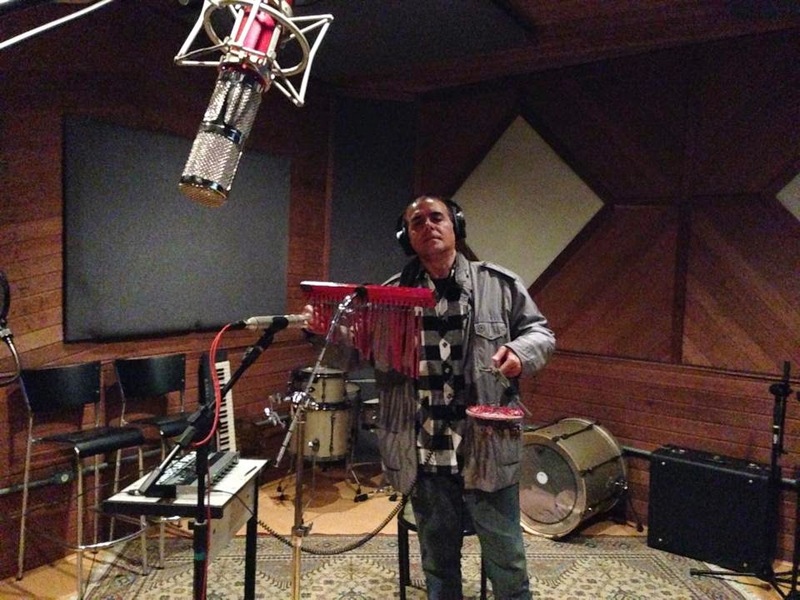 Mauricio is a critically acclaimed and award-winning drummer and artist. Since his move to New York City in 2006, he has become one of the most sought after drummers on the scene. Zottarelli is credited in more than 70 albums so far in his career, and has worked and shared the stage with some of the most important and notable artists of today, crossing over many musical styles. Some of them are: Hiromi, Eliane Elias, Marc Johnson, Prasanna, Lee Ritenour, Dave Grusin, Esperanza Spalding, Keiko Matsui, Richard Bona, Paquito D'Rivera, Joe Lovano, Richard Galliano, Chico Pinheiro, Cláudio Roditi, Joe Locke, Geoffrey Keezer, Mike Pope, Eldar, Ivan Lins, Carmen Souza, Chuck Loeb, Rosa Passos, Dom Salvador, Jovino Santos Neto, Nilson Matta, Toninho Horta, Oriente Lopez, Filó Machado, Gustavo Assis Brasil, Hendrik Meurkens, and many others. Also very active as a bandleader and composer/arranger, Mauricio co-leads and collaborates with several projects, such as the Dig Trio - with guitarist Gustavo Assis Brasil - which released its first CD in 2003 to great reviews from critics and audiences alike. 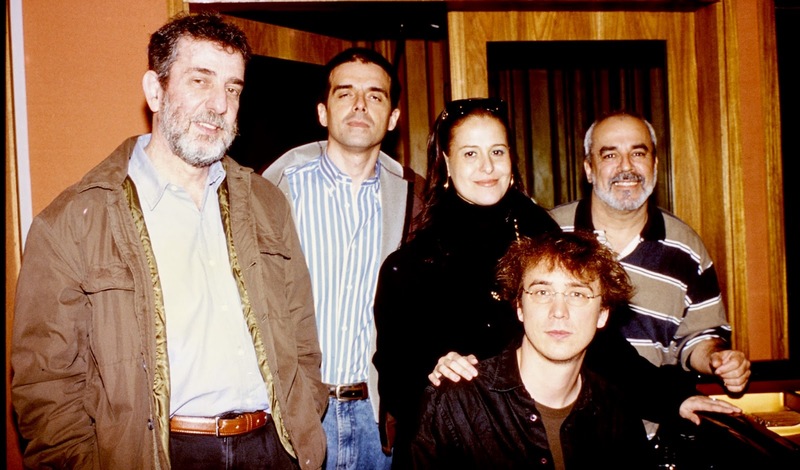 In 2009, Mauricio released his first solo album, entitled 7 Lives, which includes several of his own compositions and it features a unique mix of Brazilian jazz, fusion, and jazz. The incredible artists performing on the album are: Gustavo Assis Brasil (guitars), Itaiguara Brandão (bass), Milene Corso (vocals), Brandi Disterheft (bass), Dom Salvador (piano), Oriente Lopez (piano, flutes), Esperanza Spalding (bass), Cidinho Teixeira (piano) and Rodrigo Ursaia (sax). 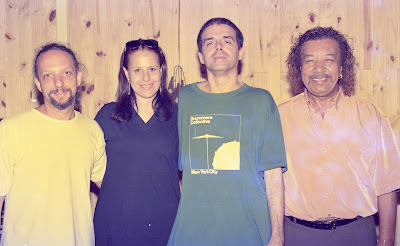 In 2011 Zottarelli released MOZIK - a collaboration with pianist Gilson Schachnik and also featuring Gustavo Assis Brasil, Fernando Huergo and Yulia Musayelyan. The album has garnered praises from many important jazz/music publications such as Downbeat magazine and All About Jazz. The prestigious Jazz Station Blog, written by journalist/producer Arnaldo deSouteiro, considered MOZIK the #1 new talent of 2011 and included the CD in their TOP 15 best of 2011. The blog also listed Mauricio in their Top 10 Drummers Of The Year list four years in a row, from 2011 to 2014. In 2012, Mauricio won the prestigious Brazilian Music Awards (Prêmio da Música Brasileira), the most important music award in Brazil, with artist Dom Salvador and his album "The Art of Samba Jazz". 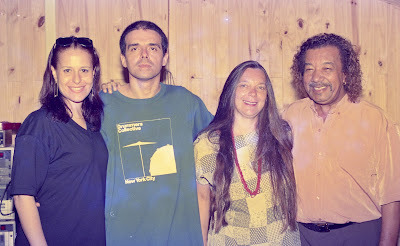 In 2014, Mauricio released another collaboration - this time with bassist Amanda Ruzza. The album is called "Glasses, No Glasses", and it is a free improvisation, live-in-the-studio recording with special guest, pianist and multi-instrumentalist Léo Genovese. Ellen Johnson, one of the world's greatest jazz singers, and piano virtuoso Jason Martineau share a musical dance through songs they love, poetry and free improvisation. From a variety of musical genres they aspire to create a duo experience of creative nuance and connection using songs that speak of the many shades of love. I had the privilege to meet Elen in the early days of her career, back in 1996, and to see her impressive development as a singer with unparelled creative force, documented on a series of superb solo albums. Seating is limited. 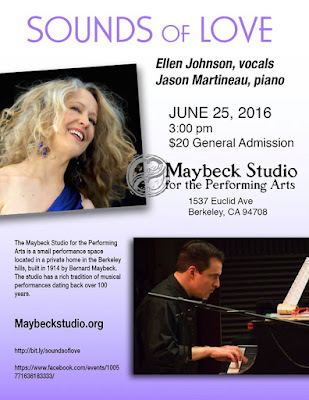 Get your required online reservation at www.maybeckstudio.org. 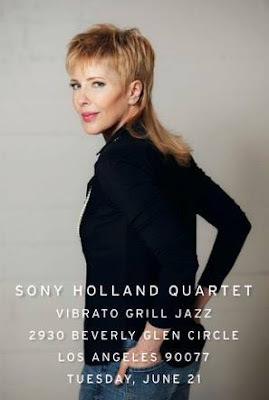 One of our favorite singers, Sony Holland will be back @ Herb Alpert's Vibrato (2930 N. Beverly Glen Cir, Los Angeles, CA) for a rare live date in LA with her band, which consists of Jerry Holland (guitar), Andy Langham (piano), Hussain Jiffry (bass) and Kevin Winard (drums). "Should be lots of fun! It's been a number of years since we've been back there and we are looking forward," Sony says. Not to be missed. You won't want to miss this dynamic duo of Dizzy Gillespie alumni as they jump start your Summer music enjoyment when the Mike Longo/Paul West Duo returns to New York's newest Jazz Room, MEZZROW, located @ 163 West 10th Street-Basement on THURSDAY, JUNE 23, from 9:00 -11:30 pm. "SEM VENDER, Setor Fecha 621 Lojas no Rio"
"No lugar de roupas e calçados, vitrines estão repletas de placas de vende-se ou aluga-se...Ícone do comércio de grifes, a galeria Forum Ipanema está com 12 de suas 60 lojas com vitrines vazias, inclusive uma na entrada, em plena Visconde de Pirajá". É como o bordão daquele antigo personagem de Jô Soares: "não querem que eu volte!" 66 Park Ave., at East 38th St. The acclaimed NY-based Brazilian jazz drummer Duduka da Fonseca celebrates his 65th Birthday with the support of his wife Maucha Adnet (vocals) plus Helio Alves (piano), Nilson Matta (bass) and Anat Cohen (clarinet & tenor sax). 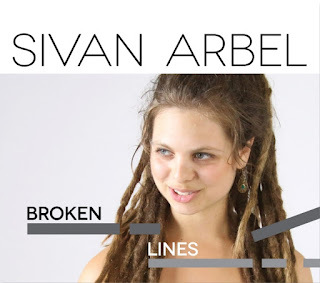 Vocalist and composer Sivan Arbel presents her debut album 'Broken Lines' at ShapeShifter Lab, located at 18 Whitwell Pl, Brooklyn, New York on Thursday, June 16 at 9pm. The cover is $10. 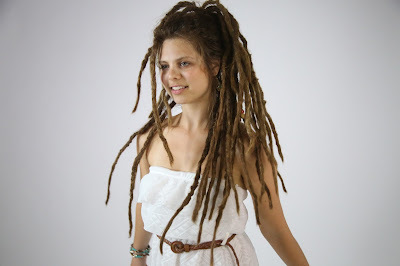 Born and raised in Israel, Sivan Arbel studied in Dublin, Ireland before moving to New York City, where she currently resides. Accompanied by a collective of international musicians, Sivan's multicultural journey shines through over the course of "Broken Lines". 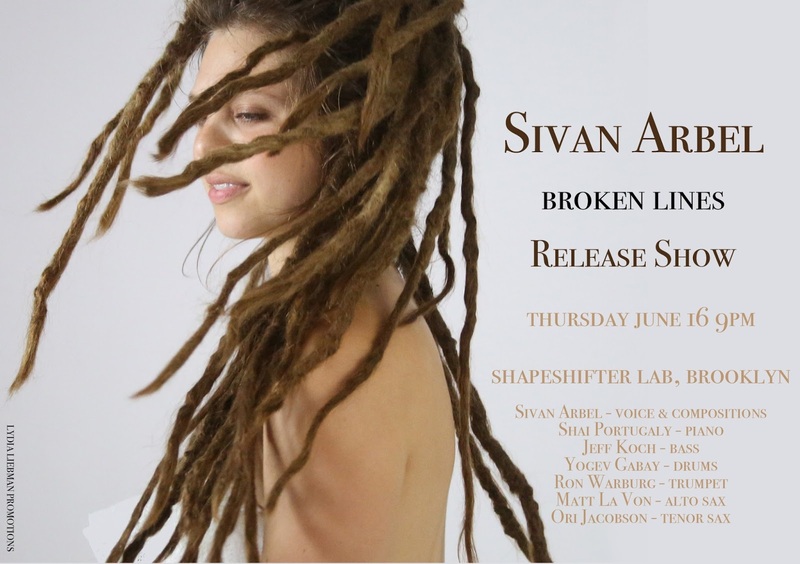 "The sound of this album is inspired by all of the people I have encountered and the experiences I have had along my journey," says Sivan, "..."Broken Lines" personifies the journey of an organic musician." Six of the seven tracks are original compositions and each one tells a unique and compelling story with each lyric carefully crafted and bolstered by the musical current below it. "Every note I sing and lyric I write has enormous meaning behind it," she says. The deeply personal nature of the album is evident on "Analysis", which highlights its emotional lyrics over dreamy arpeggios to cacophony, on the sweeping dedication to her father, "For Aba", and on the driving "Open My Tube of Art". On the Miles Davis-Bill Evans opus "Blue and Green" her creativity as an improviser and arranger is on full display. We are very excited to announce a rare live performance by one of the world's greatest arrangers (in the same level of Claus Ogerman and Don Sebesky), Nan Schwartz, who scored magnificent albums by jazz stars like Eddie Daniels, Ray Charles, Arturo Sandoval, Natalie Cole, Till Bronner and my late friend Mark Murphy. Next Wednesday, June 15, @ Herb Alpert's Vibrato with guest appearances by Arturo Sandoval, Tierney Sutton, Michael Dees, and Javier Almaráz. A 5-time Grammy winner and nominee, and a 7-time Emmy nominee, Schwartz will be joined by some of LA's finest musicians, including Dan Higgins, Bob Sheppard, Tom Ranier, Michael Valerio, Ray Brinker, Tim May, Michael Stever, Paula Hochhalter, Ben Powell, Otmaro Ruiz, legendary harpist Gayle Levant + a string section!!! 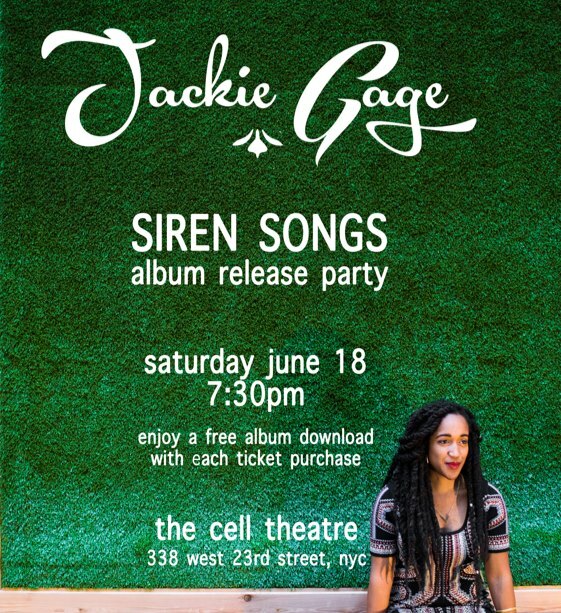 Come and see how she fits them all onstage! Only 4 seats left! Call (310) 474-9400 for reservations. ps: some years ago, Claus Ogerman, at Capitol Records Studio, took Nan by his side, and in front of the orchestra, pronounced her his "natural" successor. 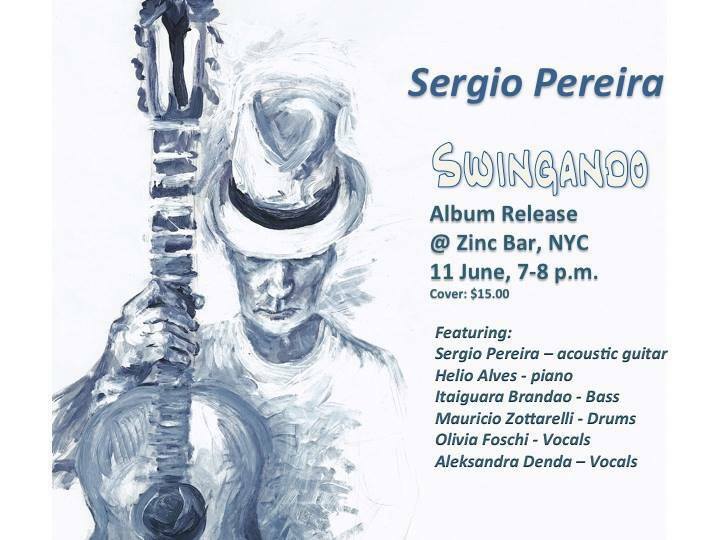 Brazilian guitarist Sergio Pereira presents the CD release concert of "Swingando" @ Zinc Bar, NY, this Saturday, June 11, 7-8pm. 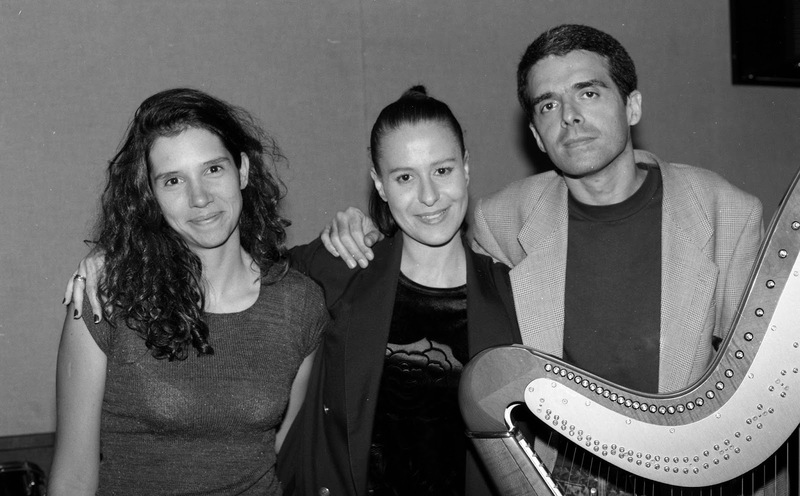 Pereira will be backed by a steallar band of expatriate Brazilian musicians, including pianist Helio Alves, bassist Itaiguara Brandão and drummer Mauricio Zottarelli, plus singers Olivia Foschi and Aleksandra Denda. 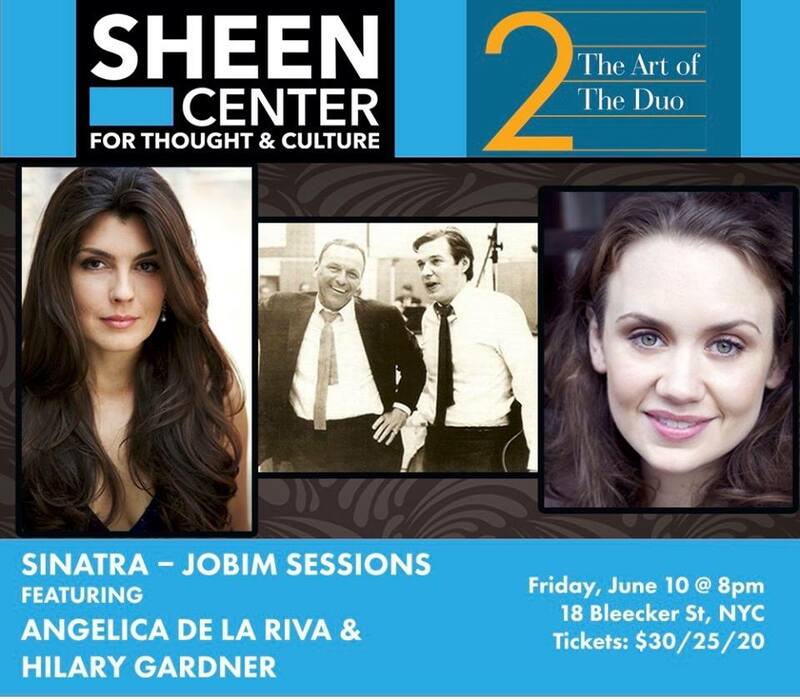 TOMORROW, June 10 @ 8pm, in NY! "Sinatra – Jobim Sessions" featuring Angelica de la Riva & Hilary Gardner with an extraordinary Quintet, featuring Rubens de La Corte, Manuel Valera, Helio Schiavo, Eduardo Belo and Joel Frahm. World renowned guitarist and composer Fabrizio Sotti is proud to announce tomorrow's release of "Forty", his fifth album as a leader. As of this next morning, the album will be officially available on iTunes and in stores. The momentous occasion was celebrated with two different launch events. The first took place this past Wednesday, June 8, at the Ferrari North America Showroom in New York City. 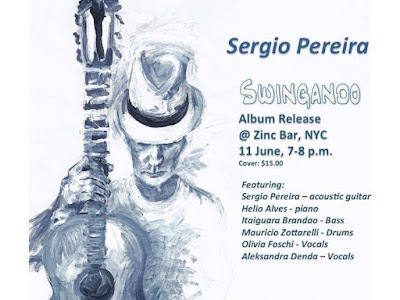 Fabrizio, who is one of the few jazz musicians to hold a major automobile endorsement, welcomed friends, fans and colleagues as they took part in an exclusive pre-release listening of "Forty". 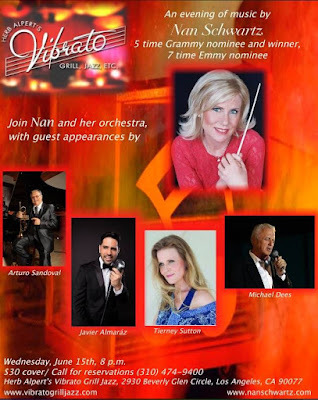 Famed celebrity photographer Johnny Nunez photographed the elegant affair. The following evening saw the release of 'Forty' in concert at the Highline Ballroom as part of the Blue Note Jazz Festival. The packed house was treated to a rousing performance of "Forty" in full by Fabrizio along with Peter Slavov and drummer Austin Williamson, who filled in for Francisco Mela last minute. The audience was also given a treat by special guest, Miles Davis and Weather Report alum Minu Cinelu. "Forty" has received early praise from All About Jazz's James Nadal, who awarded the album four stars. "Acknowledged as a remarkable accompanist who can cross genres at will, Fabrizio Sotti has also established himself as genuine guitar stylist. Forty... represents not only a milestone in his age, but a continuous dedication to refining his craft," he said. "Forty" also received a rave review from Jazz Times reviewer Travis Rogers Jr who referred to the album as "a wonder," adding "Fabrizio Sotti expresses himself with fearless abandon and reveals what beats within his heart. Peter Slavov and Francisco Mela support the moods and even enhance the moods with their easy rapport with Sotti. The writing is exquisite and the artistry of the musicians is beyond question. It is a sincere work of maturity, of wisdom, and of love." 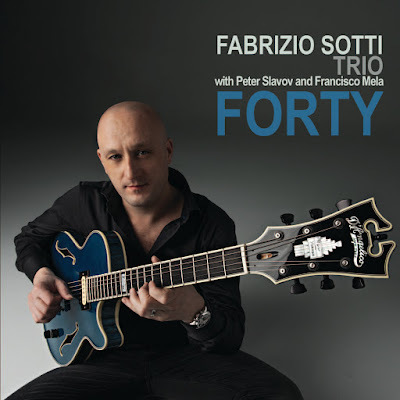 The release of "Forty" also coincides with the release of the D'Angelico EX-SS Fabrizio Sotti Signature Model guitar. Using the D'Angelico guitar as his brush, Sotti paints a dynamic sonic picture that presents him as not just an extraordinary and innovative improviser, but as the harbinger of a unique and distinctive sound that is completely his own. In the words of revered writer and critic Ted Panken, the title, "Forty", testifies to Sotti's assertion that the onset of his fifth decade signifies a sea change in both his personal life-path and aesthetic development. "Forty is more than arriving at one spot," Sotti says. "It's starting from the beginning to a new place. Artistically, as you get older, you understand how much you still have to discover, how much more deeply you can go into yourself to improve your playing and understand what you really want to say." 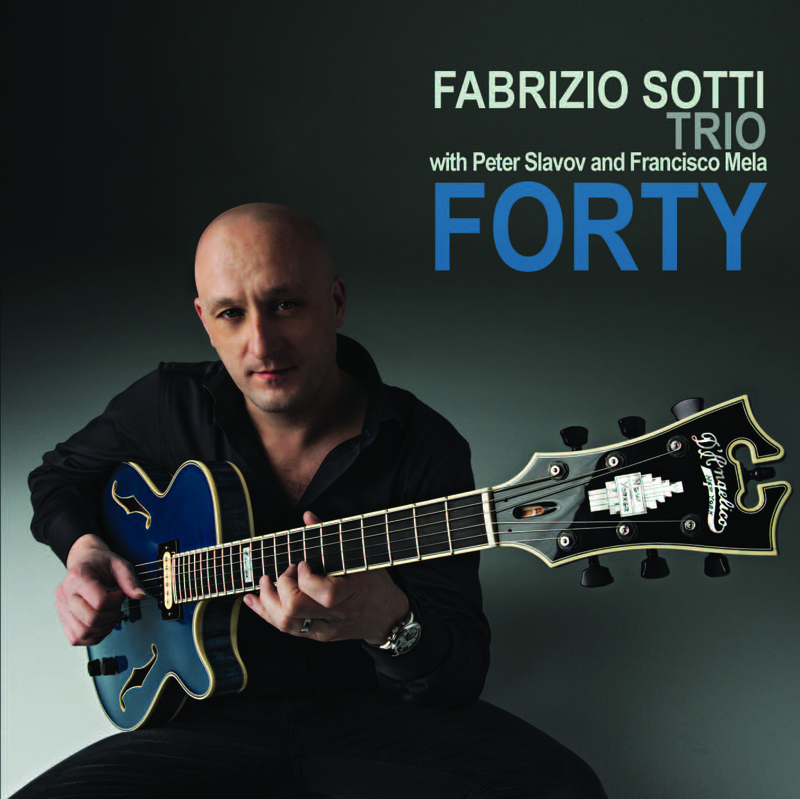 On "Forty" Sotti collaborated with two jazz visionaries in their own right: bassist Peter Slavov and drummer Francisco Mela. "Peter is a complete musician with a strong melodic sense and a thorough classical music background. He's able to be free while respecting the tradition. Francisco also brings a melodic approach and is completely a free thinker. He's a force of nature. When he swings, it swings hard; when he's not swinging, it's so creative, he fills up the music with something magical," says Sotti. "Forty" lays its groundwork for the forthcoming 9 tracks with the autobiographical "Redemption", a 3/4 minor blues that Sotti says represents the "redemption between myself and people around me, to accept me for who I really am." Sotti unleashes the full measure of his jazz chops on "Dangerous Walk," a brisk, disjunctive, Monkish line "inspired by the walk of women, and particularly my wife," and "Is That What You Think" a B-flat blues with a melody Sotti describes as 'aggressive.' The mood changes on "Beginning Now," played a cappella by Sotti on nylon string guitar but then progresses into the iconic "How Insensitive," which Sotti's grandmother played for him before he was a child. The trio returns for the calypso-flavored "Thalia," named for Sotti's year-old daughter, and written a few weeks before her birth. "The happy melody is how I felt when we were waiting for her and how she makes me feel now." Following is the expressive ballad "So Far, So Close," rendered as a Sotti-Slavov duo, which was written for his younger brother. For Sotti, the title track represents "how I like to play right now--you can hear the joyful playfulness between these different rhythms, going from a modern funk rubato to a straight ahead swinging thing, playing what I like with nothing to prove." The final track, "The Bridge", along with its preceding introduction entirely represents Sotti's mature voice. It's a love song with a bluesy connotation named for the Ponte dei Sospiri (Bridge of Sighs) in Venice, where Sotti and his bride decided to get married. With this new release, Sotti presents a departure for a new group that is only scratching the surface of possibilities with "Forty". Says Sotti, "This album shows where I am as a guitarist, improviser and composer and of what's to come." A New Yorker since 1991, when he emigrated from Padua, Italy, as an ambitious, jazz obsessed 16-year-old, Sotti drew on a broad palette of jazz-imparted musical knowledge when producing hit tracks with artists like Dead Prez,Ghostface Killah, Q-Tip, Tupac, and Whitney Houston while still in his twenties, as well as two collaborations ("Glamoured," from 2003, and "Another Country," from 2012), with jazz diva Cassandra Wilson. In parallel, he built a distinguished career as a highly-respected jazz stylist, documented on three accomplished recordings -- "This World Upside Down," from 1999, with jazz titans Randy Brecker, John Patitucci and Al Foster; "Through My Eyes," from 2003, a solo guitar recital; and "Inner Dance," from 2010, with organist Sam Barsh, drummer Victor Jones, and percussionist Mino Cinelu. Great Brazilian pianist and composer, who lived in the USA (both in NY and LA) for many years, Aloisio Milanez Aguiar passed away today, July 08, 2016, aged 69. He recorded with such artists as Victor Assis Brasil, Arthur Verocai (not only on Verocai's debut album from 1972, as well as on the "Timeless" DVD released in 2010), Gal Costa, Gilberto Gil, Jon Lucien, Cal Tjader (a terrific performance on the track "Tamanco No Samba" from the "Amazonas" album), Ron Carter ("Patrão," alongside Edison Machado, Amaury Tristão, Chet Baker, Naná Vasconcelos), Adela Dalto (with whom he was married; btw, we met for the last time during a gig with Adela @ Birdland in NYC with Portinho Drums, Sergio Brandão), Airto, Frank Colon, and Gaudencio Thiago de Mello, among many others. 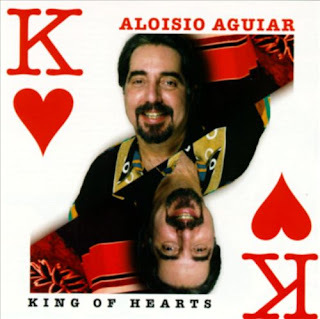 As a leader, he released the albums "Child Of The Universe" (1992, with Claudio Roditi, Nilson Matta and Portinho), "King Of Hearts" (1997, with Matta, Portinho, Sergio Brandão, Paulo Braga, Airto, Widor Santiago and Adela Dalto) and "To Jobim With Love/Live At Vartan Jazz" (1998, with Brandão and Claudio Slon), among others. My condolences to Adela, Shirley Alves de Souza and all his relatives. "Recusas da FAB impedem transplantes de 153 órgãos. Nos mesmos dias, Aeronáutica atendeu a 716 pedidos de políticos". Obrigada por lei a transportar autoridades, a FAB deixa de carregar órgãos para transplantes, o que já provocou mortes, conta Vinicius Sassine (ao jornal O Globo). Entre 2013 e 2015, a FAB recusou o transporte de 153 órgãos saudáveis que se perderam pela impossibilidade de outras formas de deslocamento. Nos dias em que os pedidos foram negados, a Aeronáutica atendeu a 716 requisições de ministros e de políticos. Aí eu pergunto: isto é um País?!? San Francisco's most elegant hotels, The Ritz Carlton (600 Stockton Street). From 6 to 9 pm. Set within a 1909 landmark building in the scenic neighborhood of Nob Hill, The Ritz-Carlton, San Francisco, the city's only AAA Five-Diamond hotel provides convenient access to the best of San Francisco and features the historic cable car right outside its doors. 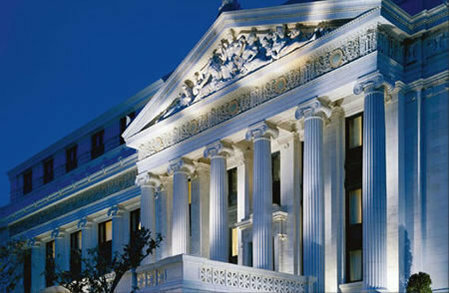 Offering globally-inspired California cuisine and seasonal cocktails at Parallel 37, the largest luxury Club Level experience in San Francisco, and recently renovated guest rooms and suites as well as meetings and special events space, the 336-room Ritz-Carlton, San Francisco provides the ultimate in personalized Ritz-Carlton service, comfort and luxury. The hotel received a "Best Hotel in the World" Award by Condé Nast Traveler for 2015, and the Gold Badge Award for a "Best Hotel in the USA" by U.S. News and World Report for 2016. 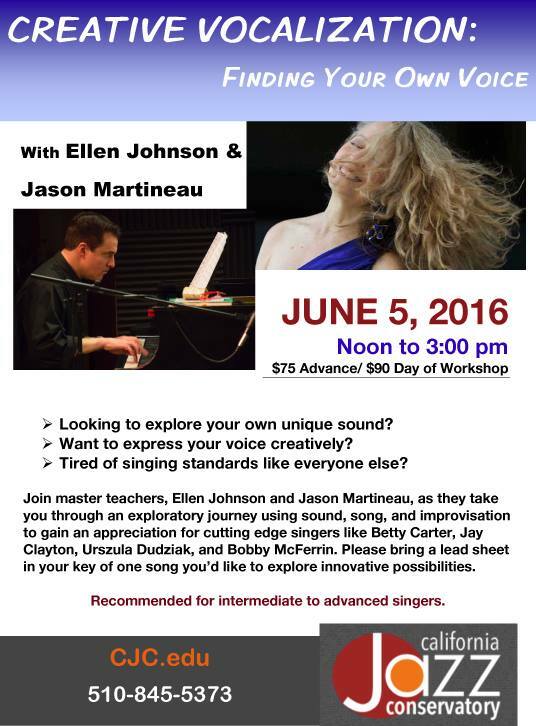 If you are a singer living in California, don't miss the "Finding Your Own Voice" workshop that the great jazz vocalist Ellen Johnson and pianist Jason Martineau will be offering tomorrow, June 5, @ the California Jazz Conservatory (2087 Addison St, Berkeley, ph: 510-845-5373). When 99% of the jazz singers want to be "the next Diana Krall" and keep performing the same old standards over and over again, it's more than recommended to listen to a highly creative singer like Ellen Johnson. As part of Verve Records' ongoing 60th anniversary celebration, Verve/UMe is proud to announce the July 15 release of eight essential Diana Krall albums in 180-gram, 2-LP vinyl reissues. The renowned pianist and vocalist has called Verve home for the vast majority of her illustrious career, and these new versions of her recordings originally released between 1996 and 2009 showcase many of her finest moments in lustrous vinyl format. These reissues, which each feature the original album in its entirety on two LPs, range from intimate trio sessions to celebratory big band outings, songbook standards to modern pop favorites and memorable original songs. All feature Krall's expressive voice and deft piano playing, along with production by three-time GRAMMY® Award-winner Tommy LiPuma. The series begins with All For You, Krall's reverent tribute to the Nat King Cole Trio, originally released by impulse! in 1996. The album features Krall leading a trio with guitarist Russell Malone and bassist Paul Keller through some of the legendary pianist/singer's most beloved tunes, with guest appearances by pianist Benny Green and percussionist Steve Kroon. Its follow-up, 1997's Love Scenes, includes 13 of Krall's favorite love songs, performed by her trio with Malone and Christian McBride on bass. A distinctly orchestral sound comes to the forefront on Krall's official Verve debut, When I Look in Your Eyes, released in 1999. Eight of the album's 13 tracks feature strings conducted by veteran composer/arranger Johnny Mandel along with an all-star jazz ensemble. The symphonic approach was expanded even further for The Look of Love (2001), which spotlights Krall's vocals backed by superb arrangements by the late genius Claus Ogerman, who conducts the London Symphony Orchestra. Recorded live during Krall's sold-out run at the legendary Olympia Music Hall in Paris in late 2001, Live in Paris captures the energy and spark of Krall's concert performances. The album's dozen songs feature several of Krall's regular collaborators, including guitarist Anthony Wilson, bassist Christian McBride, and drummer Jeff Hamilton, as well as Orchestre Symphonique Européen, conducted by pianist/arranger Alan Broadbent and, on two songs, the legendary Claus Ogerman. The Girl in the Other Room (2004) was Krall's first release to prominently feature her own original songs, many of them written in collaboration with her husband, Elvis Costello. She returned to the Great American Songbook for 2006's From This Moment On, which garnered a Best Jazz Vocal Album nomination at the 2007 GRAMMY® Awards. The series concludes with Krall's 2009 album, Quiet Nights—her tenth release—highlighted by GRAMMY® Award-nominated arrangements from frequent collaborator Claus Ogerman. Diana Krall is a star in a long line of revered and influential artists who have been featured on Verve throughout the label's 60 years. Verve was founded in 1956 by Norman Granz, the forward-thinking impresario responsible for the hugely popular Jazz at the Philharmonic concerts, which brought the music to new audiences and garnered jazz an unprecedented level of respect in popular culture. Granz also managed Ella Fitzgerald and launched the label in large part to create new opportunities worthy of the singer's immense talent, including her landmark series of "Songbook" recordings. Under the visionary leadership of Granz and, after MGM purchased the imprint in 1961, Creed Taylor, Verve continued to set new trends. The label sparked the Bossa Nova craze with the 1964 release of the GRAMMY® Award-winning Getz/Gilberto and brought a lush, elegant new sound to jazz with the arrangements of Claus Ogerman and Oliver Nelson. Its focus eventually widened to encompass groundbreaking comedy, folk and rock recordings, including now-iconic releases by The Velvet Underground, Frank Zappa & The Mothers of Invention, Janis Ian and Laura Nyro. It was its jazz legacy that cemented Verve's place in the popular imagination, however, and after a fallow period in the '70s and '80s Verve was revived in the mid-1990s, again signing many of the biggest names in music: Herbie Hancock, Wayne Shorter, John Scofield, Betty Carter, Abbey Lincoln and Shirley Horn, all of whom recorded for Verve during this period. Over the course of its six-decade history, Verve has become synonymous with the very best in jazz, venerating the music while charting its course and helping to break down racial and stylistic barriers. There's no better way to celebrate that legacy than with the music itself, and 2016's 60th anniversary releases invite listeners to revisit the breathtaking sounds of Verve in new and exhilarating ways. 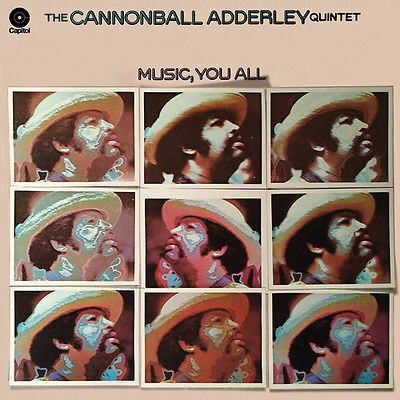 CD Reissue of the Month - "The Cannonball Adderley Quintet: Music, You All"
Recorded Live At The Troubadour, Los Angeles, CA, 1972. Featuring: Cannonball Adderley (soprano sax, alto sax), Mike Deasy (electric guitar), Ernie Watts (tenor sax), Nat Adderley (cornet), George Duke (electric piano), Walter Booker (acoustic bass), Roy McCurdy (drums), Airto Moreira (percussion). 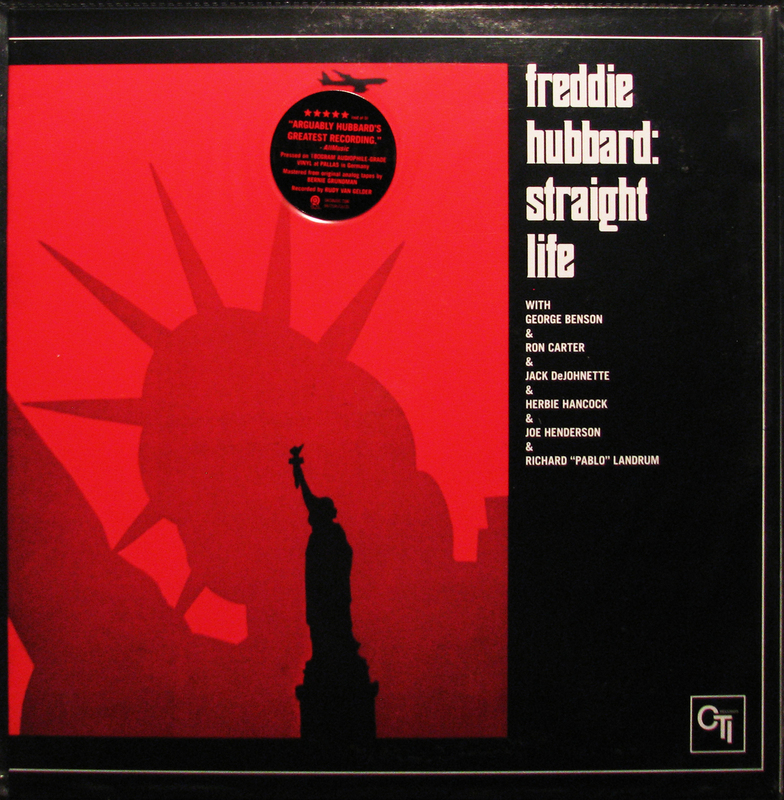 Vinyl Reissue of the Month - "Freddie Hubbard: Straight Life"
This 180gram audiophile-grade vinyl reissue, which was mastered from original tapes by Bernie Grundman and pressed at Pallas in Germany, shines new light on this amazing, underrated recording. That was Landrum's second & final session for CTI (he had previously appeared on Stanley Turrentine's "Sugar") and Irvine's first & last session for the label, although he would write two tunes for Stanley Turrentine's reunion with Milt Jackson on "Cherry." For "Straight Life," Irvine contributed the acid-jazz anthem "Mr. Clean," revisited by the 2009 incarnation of the CTI All Stars during their European tour that year and included on the "Montreux Jazz Festival" DVD. 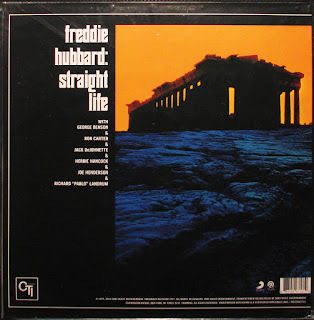 Hubbard's title track is outstanding too, and there's a pretty version of the standard "Here's That Rainy Day" performed only by the leader on flugelhorn, Ron Carter on acoustic bass bass and George Benson on the guitar. I only regret that Ron's bass was mixed too low on "Here's That Rainy Day," to the point that most of the reviews refer to that track as a duet between Hubbard and Benson. Few better – or more – words can explain what makes a great jazz album great. 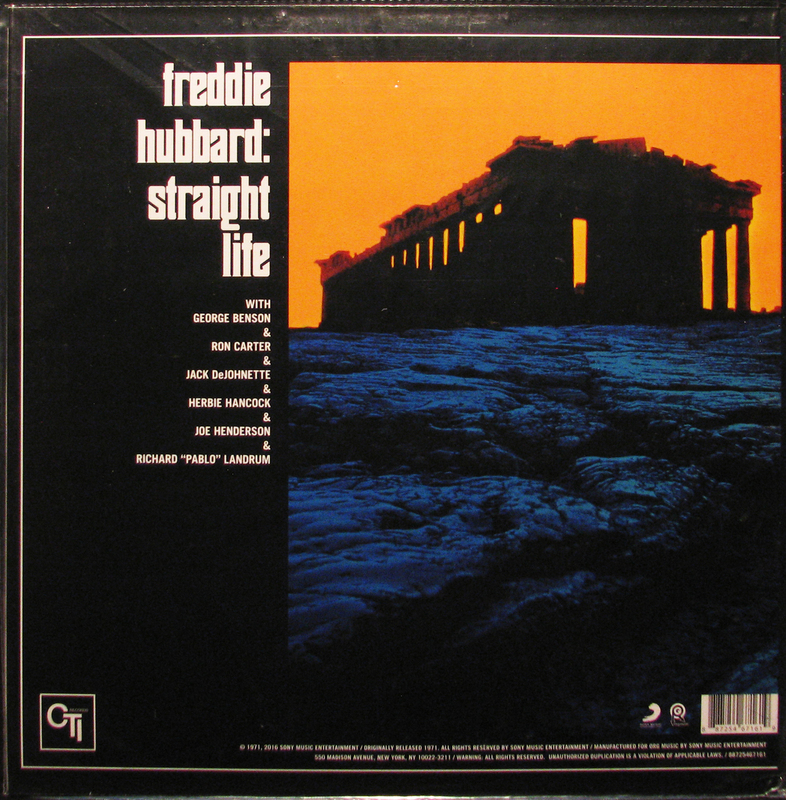 Originally released in January 1971, Straight Life confirms not only that CTI was on the right track (Hubbard’s record was the label’s 12th LP release) but, more importantly, that Creed Taylor was a force to be reckoned with in shaping the ideal of what jazz could achieve during the 1970s. But good as the music and the musicianship might be, the record was hard to program into bite-size radio formats and, in the end, it probably didn’t perform as well for Hubbard or the label as it ought to have. Straight Life reunites much of the team responsible for the solid music of Red Clay, including saxophonist Joe Henderson (first heard with Hubbard on the trumpeter’s 1965 album Blue Spirits), keyboard player Herbie Hancock (who featured Hubbard on many of his early solo records, including his 1963 debut Takin’ Off) and ubiquitous bassist extraordinaire Ron Carter, adding guitarist George Benson and percussionist Richard “Pablo” (Richie) Landrum to the mix. Jack DeJohnette replaces Red Clay’s Lenny White. It’s a dream-team of heavy-hitting modern players to be sure. But it’s interesting to note that Hubbard, Henderson, Hancock, Carter and DeJohnette had earlier contributed to Hancock’s 1966 Blow Up soundtrack and Hubbard would later re-group with Henderson, Benson, Carter, DeJohnette and fellow CTI alum Hubert Laws for the trumpeter’s lovely “To Her Ladyship” from 1978’s Super Blue. 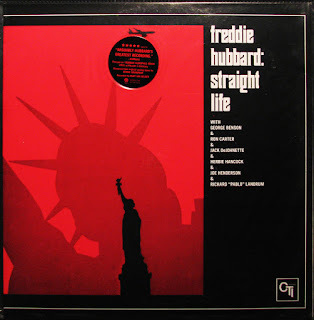 Up first is Freddie Hubbard’s 17-minute jam tune “Straight Life,” with Hancock comping gloriously on Fender Rhodes and Jack DeJohnette firing rapidly on all pistons, more like a rock drummer than a jazz drummer, but definitely a part of the song’s frenetic action. Landrum must have had to work overtime to keep up. The song is almost like a funked-up bossa. Henderson solos magnificently in a trademark style that mixes the power and fury with the passion and fire of his unappreciated and undervalued Milestone albums of the period. Henderson’s solo nearly decimates Hubbard’s own solo – nothing shabby, but hardly matching the intensity of the song’s other performers. Hancock then solos in the funky melodic style he established on Fat Albert’s Rotunda (no spacey interludes here), followed by Benson providing an almost intellectual interjection that still has the warm soulful passion that seems to suggest the composer wanted to alternate Henderson and Hancock’s jazzier interludes with Hubbard’s and Benson’s soulful passages. A percussion workout ensues to bring it all back home. Weldon Irvine (1943-2002) joins the cast on tambourine (!) and contributes the memorable “Mr. Clean,” a perfect vehicle for Hubbard’s fiery horn antics – which are at their very best here – and the band, which crafts a singularly sample-worthy and Hubbard-esque groove, rock this thing out. Hubbard, Henderson, Hancock and Benson all solo beautifully. Irvine would wax the tune again several months later with Richard “Groove” Holmes on the B-3 great’s Comin’ On Home and later on his own 1972 solo debut Liberated Brother. Each version of the tune sounds considerably different than Hubbard’s take, suggesting that Creed Taylor knew precisely how to keep everybody on target and in line. It’s worth noting that one of Irvine’s earliest recordings outside of his stint as Nina Simone’s musical director, is “Can’t Let Her Go” from Freddie Hubbard’s 1968 album High Blues Pressure. Straight Life closes out with an extraordinarily lovely performance of “Here’s That Rainy Day,” the 1953 song by Johnny Burke and Jimmy Van Heusen from the forgotten Broadway musical Carnival in Flanders. Even by 1970, when this version was recorded, the song had become a jazz standard and a favorite among pop singers, particularly Frank Sinatra, who first recorded the song in 1959 and performed it often in concert on his many TV specials. Producer Creed Taylor had also recorded the song on productions for Stan Getz, Kai Winding, Wes Montgomery, Astrud Gilberto and Walter Wanderley, so it’s fair to assume that he too liked the song just as much. In this reading, Hubbard, on flugelhorn, is paired with only guitarist George Benson and bassist Ron Carter for a truly inspired take that warrants classic status. While it’s probably no surprise that “Here’s That Rainy Day” was issued as the album’s single, it’s probably less surprising that this lovely jazz instrumental didn’t turn into a hit when Elton John’s “Your Song” and Santana’s “Black Magic Woman” ruled the airwaves. For whatever reason, Straight Life is graced by not one but two Pete Turner photographs, a rarity in the CTI discography, as was the trumpeter’s follow-up album First Light. The photographer has no idea why designer Bob Ciano juxtaposed these two photographs. But he clearly approves. The back cover, “Parthenon” (1964), was from a series the photographer produced cataloging various wonders of the world, but “not picture-postcard style, more interpretative.” The abstract take on monuments honoring the Roman goddess of freedom (Libertas) and the Greek goddess of wisdom (Athena) has a curiously perfect relationship to the music of Straight Life. Fusion CD of the Month - "Brandee Younger: Wax & Wane"
If you like Dorothy Ashby (1932-1986), whose 1968 ground-breaking session for Cadet, "Afro Harping," is a cult album for the hip-hop jazz generation, you'll love Brandee Younger. Her "Wax & Wane" album is a jazz-funk project full of infectious grooves and high musicianship, evoking the past but diving in the future in a visionary way. Brandee and flutist Anne Drummond, both gifted with flawless technique and "spiritual imagination," act like co-leaders of a tight ensemble, with electric bassist Dezron Douglas shining throughout the album with his "fat" sound connected with the beats propelled by drummer Dana Hawkins. Tenor sax player Chelsea Baratz showcases a warm sound that evoked me memories of Stanley Turrentine's soulful approach. The opening track, "Soul Vibrations," also was the opener of Ashby's "Afro-Harping album." Written by the late bassist and arranger Richard Evans (who worked a lot not only with Ashby but also with Ahmad Jamal and Ramsey Lewis), it's a good portrait of the album, mixing a wah-wah guitar riff, hypnotic drum beat, a groovy bassline, and impressionistic flute & harp performances. Like Karas Lamb wrote in the liner notes, this album is "a luminous patchwork that stitches cascading sheets of sound and pulsing arpeggios with the thread of tribute. A kaleidoscopic release that travels straight throughout the heart... a speeding bullet that lands with a burning immediacy that belies the shimmering beauty imparted by Drummond and Younger's band. A solemn prayer to her afro-harping forebears, the album is a fanfare of flight and fancy that speaks to the possibility of Younger's apparent dexterity and the potential of every leader willing to burn the rule book in order to push the culture forward." 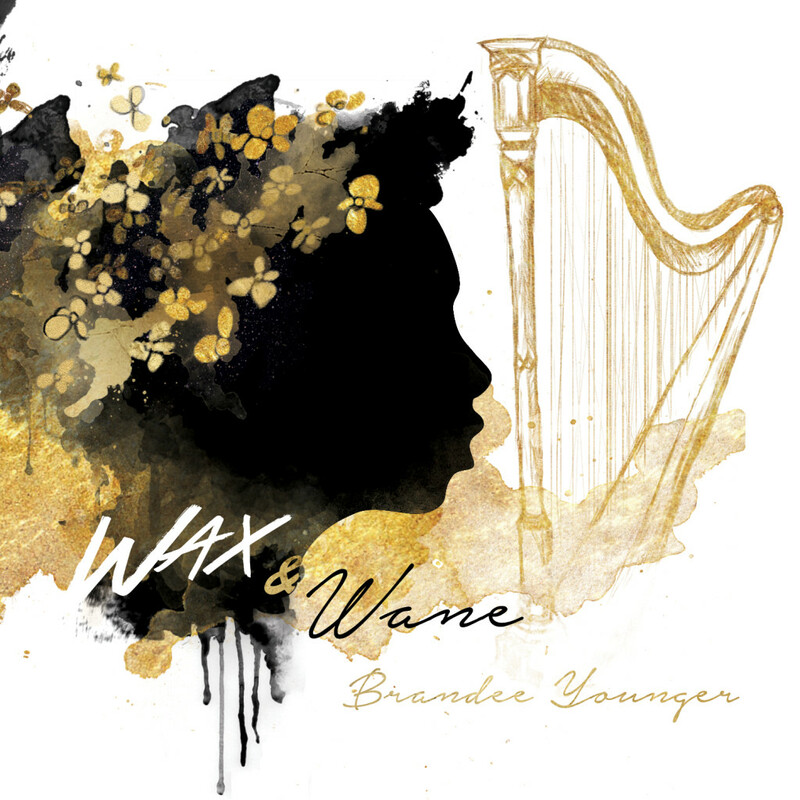 With “Wax & Wane,” Brandee Younger is poised to take her place as a sonic tour de force and the latest innovator in a lineage of groundbreaking musical agitators leading to the rise of the harp. Spiritually transcendent and perennially fresh, “Wax & Wane” strikes a delicate balance between pushing the envelope and flat out breaking the mold. “I wanted to place the harp in a totally different context than what listeners are generally accustomed to and continue to position the harp in way that’s relevant today,” says Younger. With this seven track collection, Younger presents an altered universe where the fluttering polyphonic exchange of the harp and flute expand and contract against a dense rhythmic display. usic." Masterpiece CD of the Month - "Carlos Franzetti: Argentum"
The musical world of composer/pianist/arranger Carlos Franzetti is vast but his love and appreciation of the music of his birthplace, Argentina, has led him to become one of the foremost experts and exponents of tangos, chacareras, zambas and other Argentinean folkloric forms. His new recording, "Argentum," showcases his adept handling of the various types of music from a diverse cast of Argentinean composers, including a few compositions of his own, all in intimate combo settings. The Buenos Aires born Franzetti was steeped in the musical traditions of his country from an early age. He moved to the United States to further his music studies and begin an incredible career as a performing pianist, composer, arranger and conductor for a wide-ranging group of artists, including Ruben Blades and Ray Barretto. Franzetti’s work has focused on the music of Argentina for inspiration and has resulted in his becoming one of the foremost interpreters of the music, and, ultimately, in his becoming a leading figure in the expansion of these traditional forms. For "Argentum," Franzetti has arranged a number of pieces written by well known composers, such as Astor Piazzolla, as well as works by lesser known composers, all for small ensembles led by his own exemplary piano playing. The recording sessions were split between studios in Paramus, New Jersey and Buenos Aires. The United States based musicians include his wife, pianist Allison Brewster Franzetti, bassist David Finck and saxophonist Lawrence Feldman. 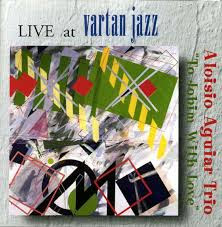 His Buenos Aires trio includes guitarist Ricardo Lew and bassist Juan Pablo Navarro. The recording begins with Juan Carlos Cobian’s well-known “La Casita de Mis Viejos,” a world-weary tune arranged for two pianos and bass. Folk music revivalist Eduardo Lagos’ chacarera “La Oncena” is done in a stripped down duo arrangement with Finck’s dancing bass. Franzetti’s own harmonically lush “Argentum” is a study in counterpoint between Feldman’s soprano and Franzetti’s melodica. The Argentinean trio executes the beloved Enrique Delfino “Milonguita” with aplomb, while their take on Piazzolla’s “Bandoneón Guitarra y Bajo” is rhapsodic and expertly played. 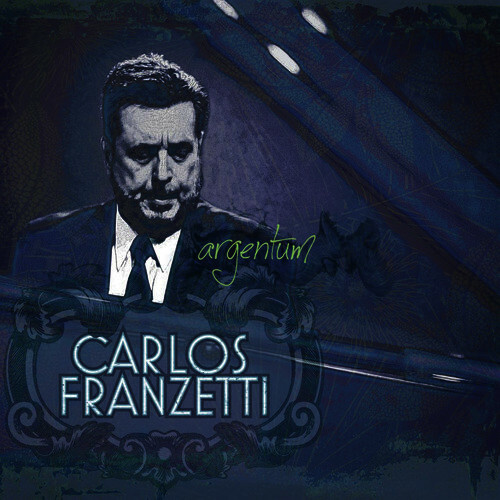 Carlos Franzetti is a leading voice in the development and preservation of the national music forms of Argentina. "Argentum" provides a wonderful example of the breadth of his tastes and talents. It also is a fantastic example of the different styles of music that have emerged from Franzetti’s beloved home. Vocal Jazz CD of the Month - "Sivan Arbel: Broken Lines"
Instrumental Jazz CD of the Month - "Dave Liebman & Richie Beirach: Balladscapes"
Although I was a big fan of Dave Liebman's artistry since I heard him with Miles Davis in my native Rio, the first time I became aware of his partnership with Richie Beirach was exactly 40 years ago, when their "Forgotten Fantasies" duo album for John Snyder's Horizon label was, for some miracle, released in Brazil in 1976. I remember listening to that vinyl over and over again, deeply impressed by their deep interplay on such complex tunes like the 13-minute long "Obsidian Mirrors," my personal favourite track. Since then, I kept both Liebman and Beirach under my radar not only when they performed together -- like on those memorable albums by their Quest group and on that fantastic "Tribute To John Coltrane - Live Under The Sky" CD/LaserDisc (filmed in Japan with a quintet completed by Wayne Shorter, Eddie Gomez and Jack DeJohnette) that later was reissued on DVD -- as well through the listening of their individual projects. I even had the privilege to attend some clinics and masterclasses conducted by Liebman at IAJE conventions when we were both members of the now-defunct International Association of Jazz Educators. 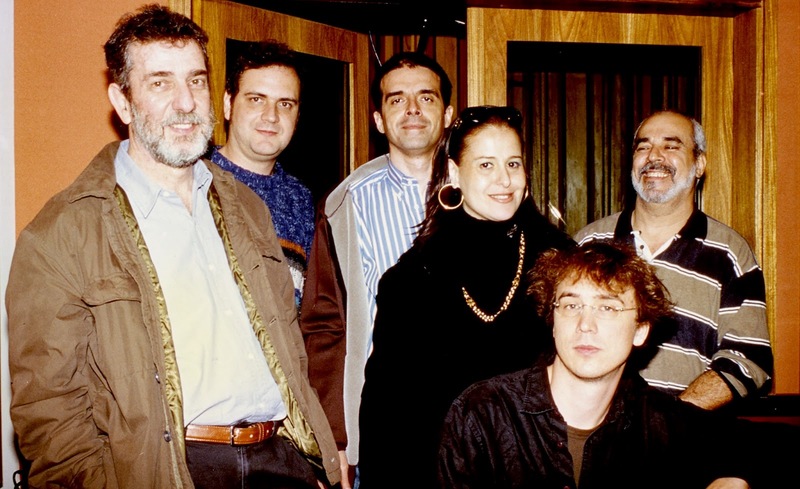 Both Liebman and Beirach also were often included among the "top artists of the year" in the annual Jazz Station Awards, initially presented in my weekly column in the Tribuna da Imprensa newspaper, and later also on the cyberspace through this website. 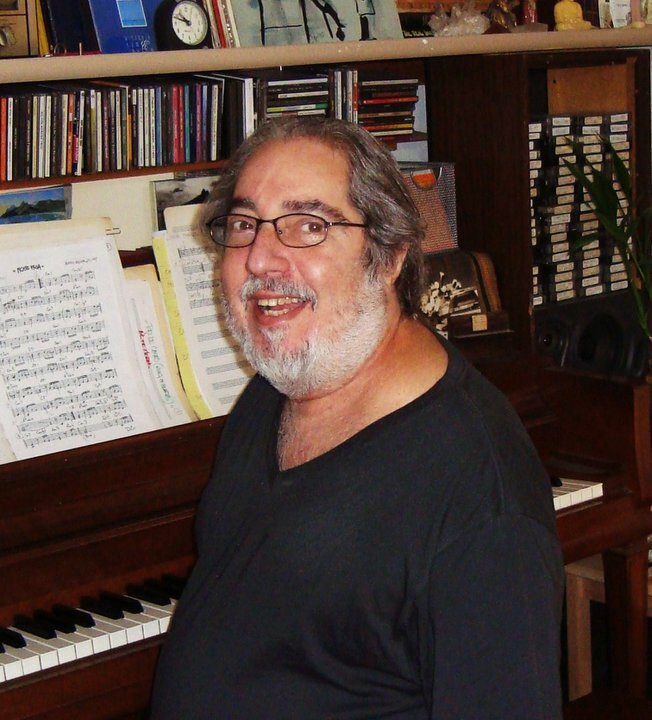 In 2015, for example, Liebman was elected #1 soprano sax player in the 37th Annual Jazz Station Awards, for his "The Puzzle" album (Whaling City), while Beirach appeared among the top piano players thanks to his "Varuna" CD with Laurie Antonioli (Origin), also voted among the best albums of the year. Now I'm mesmerized by their new outstanding duo project, "Balladscapes," produced by Kurt Renker, recorded in April 2015 and released in April 2016 by the Intuition label. Like on my desert island disc "Forgotten Fantasies," Liebman plays flute, soprano and tenor sax, with Beirach focused on the acoustic piano. No acrobatics, just the essence of expressiveness. The program includes four astounding originals, some standards ("For All We Know", "Moonlight In Vermont," the enchanting "Lazy Afternoon") and jazz classics -- from Billy Strayhorn/Duke Elington's "Day Dream" to John Coltrane's "Welcome/Expression", from Wayne Shorter's "Sweet Pea" originally recorded by Miles Davis to bossa nova master Antonio Carlos Jobim's "Zingaro" made famous by João Gilberto --, and even a J.S. Bach piece ("Siciliano," from Sonata No. 2 in E-flat major for flute and harpsichord.) It's haunting music of the highest caliber. But it's also sublime poetry of the highest sensitivity. Almost 50 years. An eternity. Lyndon B. Johnson was still president, the Beatles were on the stage for a concert for the last time and the film "My Fair Lady" won eight Oscars. Half a century. Dave Liebman and Richie Beirach have known and appreciated each other as persons and partners for that long. The now 69-year-old soprano and tenor saxophonist and his 68-year-old partner on the piano got to know each other at a jam session at Queens College in New York. Two hungry students, intoxicated, euphoric and inspired by all the jazz greats, who expanded the horizon for the musicians of that time. The two met on a regular basis, either in Liebman's loft on 19th Street in Manhattan or in Beirach’s pad on Spring Street. They helped each other to work out each one’s own vocabulary. They mostly played free jazz in the style of late Coltrane, tried everything possible, let themselves go and gradually found a common inner pulse. 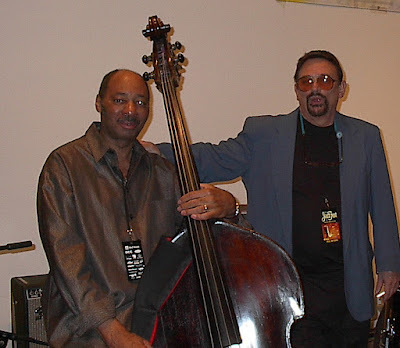 Sometimes the bassist Frank Tusa also came by and complemented the creative "hanging out" relationship. However, it was not until 1973 that the “soul mates” recorded their first joint record. Liebman was on tour with Miles Davis in Japan at the time when he ran into Beirach, who was on tour with Stan Getz at the same time. Along with Jack DeJohnette and Dave Holland, they finally recorded Liebman's debut album "First Visit". One song from that session stayed in the mind of the friends to this day: "Round Midnight". It was the very first duet of countless others that were to follow over the next 43 years, either in live performance with the bands Lookout Farm and Quest or in other joint projects. "Because a duo," legendary producer Michael Cuscuna wrote in the liner notes to Balladscapes, “is probably the purest and most direct form of musical dialog. It gives those involved a certain form of freedom, which they can use for seemingly endless solos full of color, emotion and depth and eventually lose themselves in it. Everything that Dave and Richie make together possesses a great deal of substance and intelligence, completely independent of the respective context or genre." 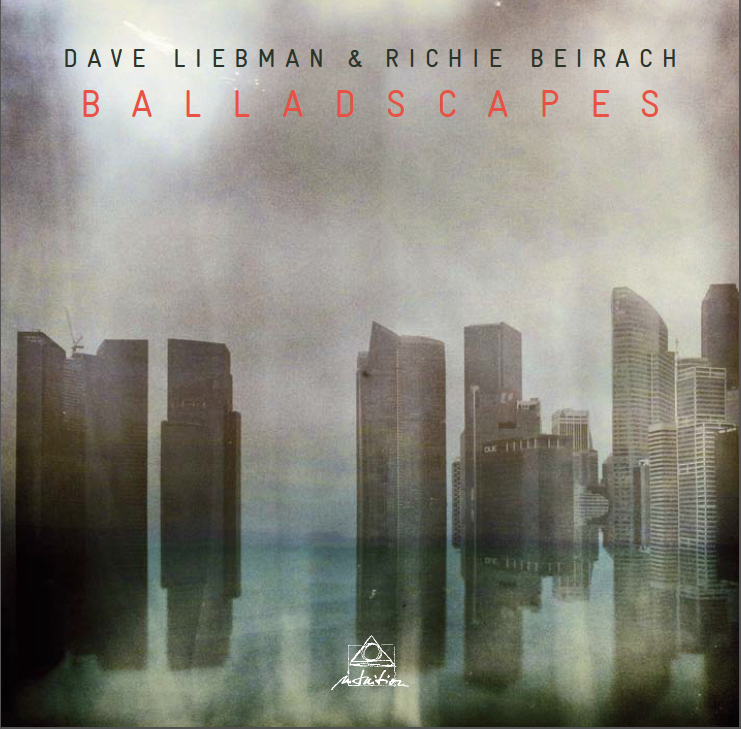 Although Dave Liebman and Richie Beirach enriched their musical dialogs regularly with ballads over the past decades, Balladscapes is but the first pure ballads album on a long shared path. But whoever knows the musical vita of the adventurers already suspects that even this digression need by no means automatically end on the smooth paved road of the mainstream. 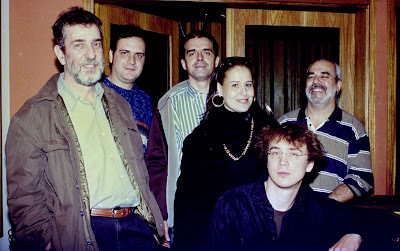 The 13 songs recorded in the CMP Studio in Zerkall include both some new and old original compositions such as "Quest" and "Kurt country", but also unorthodox arrangements of Johann Sebastian Bach ("Siciliana"), Kurt Weill ("This Is New"), Antonio Carlos Jobim ("Zingaro"), Wayne Shorter ("Sweet Pea"), Billy Strayhorn ("Day Dream") and, of course, John Coltrane ("Welcome/Expression"). 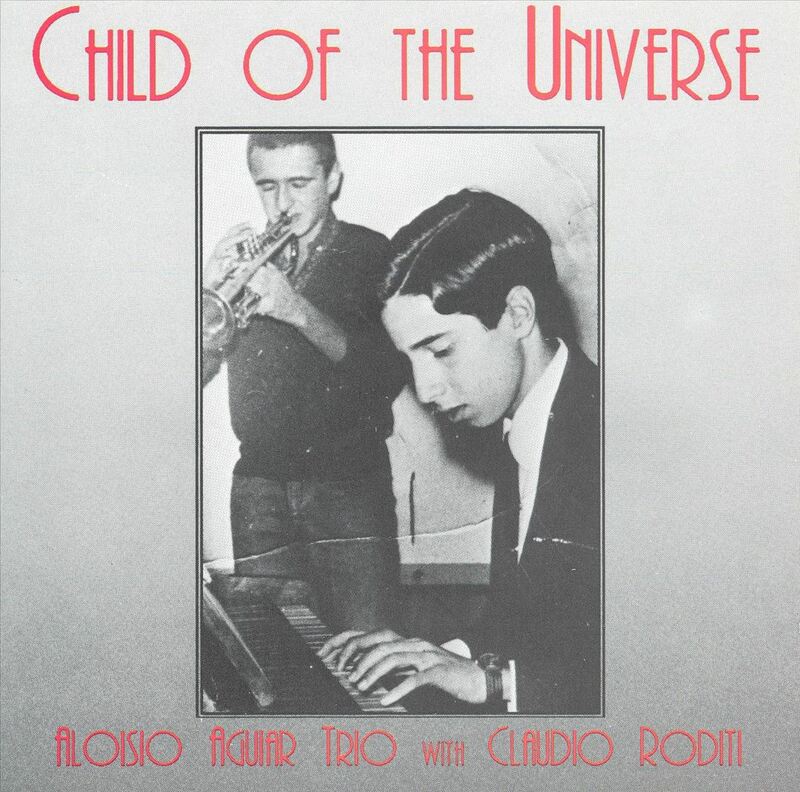 A rich, wide field opens on which the soprano saxophonist (who also plays the tenor saxophone and the flute here) and the piano rub against each other, intertwine and back each other up in an optimally coordinated, familiar, but always dignified dialog to their hearts’ content. 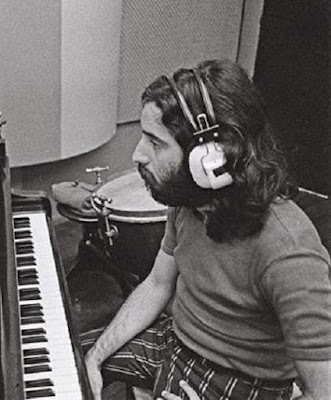 "In each of my previous bands in which Richie was involved, he had the function of an anchor, more than any bassist or drummer," Dave Liebman praised the special qualities of Beirach. "Because his timing is just perfect!" As a result, the interplay on Balladscapes is also based on an inner symmetry, which people can only develop together when they know and like each other. For nearly half a century.